Joe Launchbury is only 24 years old, and is already one of the greatest players to wear the black and gold of Wasps rugby. The first name on the team sheet for both Wasps and England he is one of very few truly world class players in the Aviva Premiership at the moment. Joe was educated at Christs Hospital – a private boarding school in Sussex. He showed an early aptitude for Rugby, captaining the school team before signing for the Harlequins academy aged 15. Quins did not offer him a professional contract, so Joe left and played for Worthing – A National League 2 (South) side. The coach there was former Wasp Will Green, who recognised Joe’s natural ability and recommended him to his old team. He played a few games for the A team, and shortly afterwards was offered a full time place in the Wasps Academy. He made his first appearance off the bench against his old club Harlequins in the LV cup scoring a try. His next game had him starting against Leicester Tigers in the Aviva Premiership. He has been a fixture in the team ever since. He was named Young Player, and Academy Player of the season that year, and later Premiership Young Player of the Season. Joe Launchbury stands 6 foot 6 Inches tall (1.98m), and weighs in at 18st 8lbs (118Kg) and regularly plays at Lock for both Wasps and England, but is perfectly capable of switching to the back row if necessary. He won his first senior international Cap off the bench against Fiji in the autumn internationals in 2012. He impressed enough that he started the next game against Australia, and also the following game where England recorded their first win over New Zealand since 2003. He went on to be voted as Man of the Series. After the following Six Nations Joe was named England Player of the year. Joe Launchbury is well on his way to becoming a Wasps legend. His worst performances are still better than most, and his name has even been suggested as a future England Captain. Whatever happens for Joe in the future it is safe to say his name will be remembered for many years to come within Wasps Rugby. Photo: Richard Lane/Richard Lane Photography. Pre Season Friendly. Worcester Warriors v Wasps. 26/09/2015. 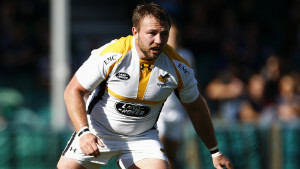 Wasps’ Matt Mullan.  Born in Brighton in February 1987, Matthew James (Matt) Mullan is currently first choice loosehead prop, and also co-captain of Wasps Rugby 1st XV. He originally played for Worcester Warriors for 8 years before signing for Wasps Rugby in 2013 where he instantly made his presence felt on the field. For a number of years Mullan was on the edges of the England squad with the odd call up as injury cover. However he made his most serious claim for the squad in 2013/14 where he was in the squad for the Autumn Internationals, The Six Nations, and the England squad who toured New Zealand in 2014. He fell out of favour with Stuart Lancaster during his disasterous World Cup campaign, but is now playing his best rugby ever and knocking on the door of the England squad once again. In the Aviva Premiership match against London Irish at Twickenham Matt Mullan’s stats are hard to believe. Throughout the match he made 14 carries – only Nathan Hughes made more. He made 9 tackles – only Thomas Young made more. He made 9 passes – as many as Elliot Daly. And made more metres with the ball in hand than both Ashley Johnson and James Haskell. As if this wasn’t enough he managed all of this without even being on the pitch for the full game. He was replaced by the impressive Simon McIntyre at 60 minutes. This season so far he has held his own against a series of International tight head props. Henry Thomas of Bath (England). 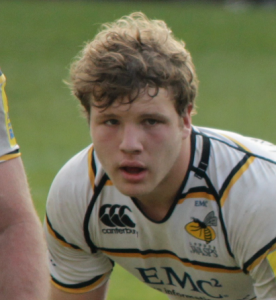 Matt Mullan is an absolute stalwart of the Wasps Squad, and is getting better and better every season. Under the tutelage of Dai Young, himself a former Welsh International and British Lion Prop forward he has come on leaps and bounds. He is the leaer of a new generation of powerful, mobile prop forwards, and is one to watch for the future. Photo: Richard Lane/Richard Lane Photography. Wasps v Exeter Chiefs. Aviva Premiership. 05/12/2015. Wasps’ Alapati Leiua. Alapati Leiua is a Samoan International Utility Back who can play Wing or Centre who signed for Wasps in April 2014. Born on the 21st September 1988 in Malie, Samoa, he spent four years playing for the Hurricanes and the Wellington Lions in New Zealand, turning down the opportunity to play for the All Blacks under residency rules in order to play for his country of brith Samoa. His was on glorious form in 2014 when he landed in the UK for the first time, and pretty much instantly claimed the starting spot in the centre running some intelligent lines, and breaking tackles left right and centre. But his luck was not to hold. Not long after moving from the other side of the world with his partner his father died back home in Samoa, and not long after that he ruptured his Anterior Cruciate Ligament leaving him sidelined for the rest of the season, and for the early part of this season as well. However it has given him time to concentrate on his recovery and he made his first appearance against Exeter Chiefs off the bench last week at the Ricoh Arena. He looked as sharp as ever, and significantly larger. After the match Leiua said ” it was great for me to get back out there. It’s been a long time now and I’ve worked really hard to get back, so to finally pull on a shirt again was really good for me.” He knows however that it won;t be easy to break into the team that so demolished both Leinster and Toulon in short succession, but after Christain Wade’s recent foot injury perhaps a move back to the wing is in order? Let’s hope that 2015/16 is the season where he finally shows his potential in the Premiership and recreates some of the form he showed glimpses of before his injury. A back three of Alapati Leiua, Frank Halai and Charles Piutau could be something very special indeed. His partner is now his fiancee, and his injury prone days are long behind him. I predict 2016 is going to be a good year for Alapati Leiua.